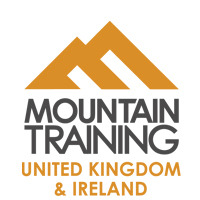 Mountain Training is the collection of awarding bodies for skills courses and qualifications in walking, climbing and mountaineering in the UK and Ireland. A diverse and active outdoor society, supported by inspirational leaders, instructors and coaches. To inspire, enable and develop people in walking, climbing and mountaineering through the provision of nationally and internationally recognised skills training and leadership qualifications. The safe enjoyment of walking, climbing and mountaineering. We disseminate guidance on good practice and provide training and qualifications for participants, instructors, leaders and coaches. High quality training and assessment delivered by experienced and supportive practitioners. Developing independent walkers, climbers and mountaineers who practice and encourage, sustainable and sympathetic use of the outdoors by all users. Supporting equal access to our sport for people from all backgrounds. We also believe that all people have the potential to develop leadership and coaching skills if trained appropriately. Good leadership is about more than decision making and technical skill; it is about supporting and developing individuals. Inspiring people to enjoy walking, climbing and mountaineering with confidence and skill. 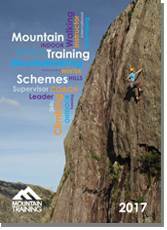 All of our nationally-recognised schemes are designed to educate and train people so that they can safely enjoy the climbing walls, crags, coast, hills and mountains of our beautiful country. Our qualifications train and assess people to look after other people in these environments, whether that's leading a walk in the mountains, coaching in a climbing wall or teaching multi pitch rock climbing. People who hold our qualifications have been assessed at a nationally agreed standard and may be volunteers, youth workers, outdoor instructors or teachers. Courses are run by approved providers who are scattered all around the UK and Ireland. When you book onto a course, they’re the ones who will train and assess you, teach you how to climb, navigate, lead etc. On a day to day basis, Mountain Training is run by a small staff team based in North Wales, Aviemore, Manchester and Dublin. There are also quite a few volunteers who represent the interests of outdoor and educational organisations and help to steer Mountain Training at a strategic level. Without these volunteers, we’d find it a lot harder to do what we do. If you would like access to support and development as you work towards a qualification or after you've passed an assessment, you can join the Mountain Training Association (MTA). Mountain Training candidates are not automatically members of the Mountain Training Association, but you can choose to join for a small annual fee (currently £36). Benefits of membership include access to workshops and further training opportunities, a quarterly magazine, gear deals, an online development (CPD) record and discounted insurance to name but a few. Find out more about the Mountain Training Association. 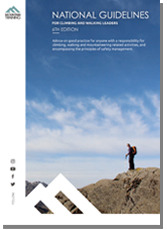 The National Guidelines are useful for anyone with a responsibility for climbing, walking and mountaineering related activities. The document offers advice and guidance on the full spectrum of considerations including operational guidelines, the ‘four ways to competence’ and the responsibilities of the provider, leader and participant. If you want to know more about competence, risk assessments and the principles of safety management, the National Guidelines is the place to look.